Playing as #1 in the VolleyMob Top 25 for the first time, BYU swept a top-five opponent in USC on a neutral court to remain unbeaten. It gives the Trojans their second loss in three matches, while BYU gets their second top five victory – both over Pac-12 foes. That should give them a great chance at earning a top four seed if they can take care of business the rest of the way while USC will look to regroup through the rest of the weekend. Leading the way once again for the Cougars was Roni Jones-Perry (26 kills, .442, 2 blocks), who finished one kill short of BYU’s three-set rally-scoring era record. In fact, that was more than half the team’s kills while McKenna Miller (8 kills, .222, 5 digs, 5 aces) provided a phenomenal serve to spark one of the team’s biggest advantages. Setter Lyndie Haddock-Eppich (34 assists, 11 digs, 4 kills, .571) was strong all-around and made sure to establish Jones-Perry as much as possible since it was consistently working. Mary Lake also tacked on 15 digs while Kennedy Eschenberg (6 kills, .222, 2 blocks) was third in kills. Even in the losing effort, we saw quite the battle on the pins. It wasn’t quite the explosion of Jones-Perry, but Khalia Lanier (13 kills, .275, 15 digs, 2 aces) was exciting. Brooke Botkin though was limited on the right side of USC’s net to an uncharacteristic .098 day despite reaching 13 kills and 6 digs. 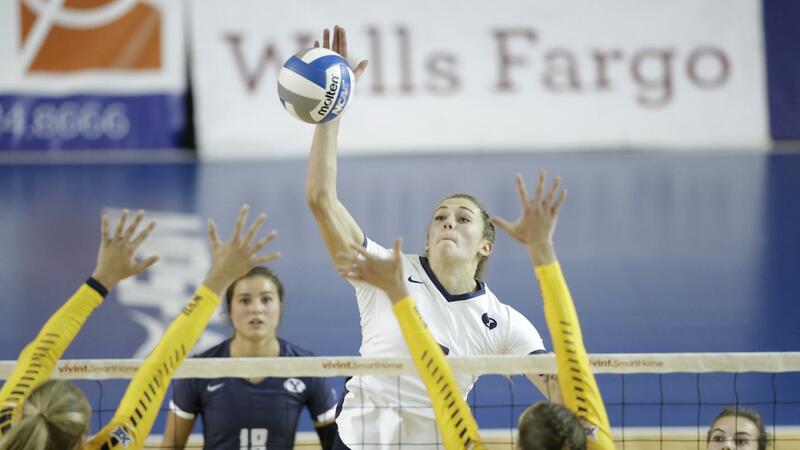 It wasn’t the first time taking on BYU for Emily Baptista (13 kills, .355, 3 blocks, 2 digs), who transferred into USC from the West Coast Conference and Pacific along with former Pepperdine middle blocker Jasmine Gross (6 kills, .462, 4 blocks). Each did a strong job countering BYU, as Baptista even had seven first set kills, but the wagons fell off for the Trojans after the opening game when they couldn’t close out the set. In total, BYU logged a higher hitting efficiency (.287 to .242), more kills (47-46), assists (46-45), blocks (6-5) and aces (9-2) – which was really the difference of the team’s being in system as passing favored BYU. USC did wind up with more digs (59-58). Both sides will continue in Wisconsin for the rest of the weekend with more matches tomorrow and a slate more coming later tonight.